Themes: mateship, family, identity, culture, grief, loss, change, disability, homosexuality, school, year 12. I have some Greek family friends and I love nothing more than listening to their tales and eating their spanakopita…I really do think I should have been born Greek. Click on title link or cover image to purchase this book through Booktopia. Click here to purchase for your idevice. Greek/Australian YA author, Will Kostakis was a guest at our school literature festival a few years back. He was funny, entertaining, clever and inspiring…all the things you want in a guest speaker. He visited again recently and told our students that he started writing his new book ‘The First Third’ after his first trip to our school where he was talking with students about his Greek Yia and other Nona and grandmother stories. So we are totally taking some small credit for this book! 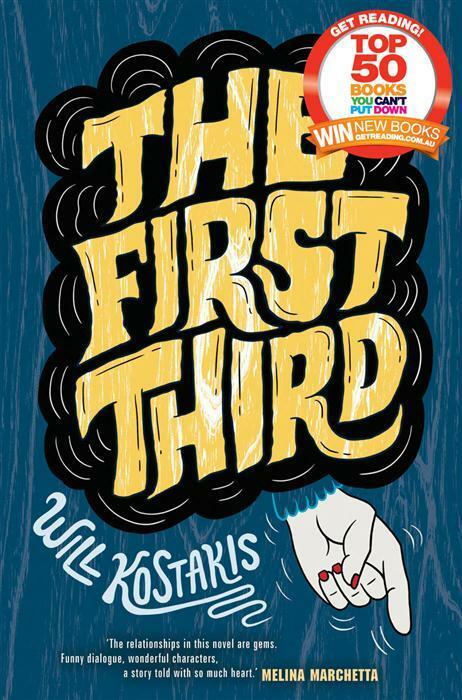 ‘The First Third’ is fiction, but with enough truth to make it authentic. I laughed out loud, I cried real tears and I felt so very ‘in’ the world of this book as I was reading it. It’s a modern Greek tragedy/comedy which embraces all things family – the good, the bad and the just plain embarrassing. Life is made up of three parts: in The First Third, you’re embarrassed by your family; in the second, you make a family of your own; and in the end, you just embarrass the family you’ve made. That’s how Billy’s grandmother explains it, anyway. She’s given him her bucket list (cue embarrassment), and now, it’s his job to glue their family back together. Fixing his family’s not going to be easy and Billy’s not ready for change. But as he soon discovers, the first third has to end some time. And then what? This is a wonderful and heartwarming coming-of-age story with a cast of characters who are fully fleshed out. Readers will want to meet 17-year-old Billy Tsiolkas, Yiayia Filyo, his family and friends; and give some a huge hug and say ‘it will all be okay’ and give others a good slap! Will Kostakis is just 24, and perhaps his age helps with the fact that his interweaving of 21st century social phenomena like twitter and online dating, feels natural and clever. He never over-plays it, and the more universal themes of cultural identity and complicated family lives can still be identified. I also applaud his positive representations of disability and sexual orientation. All together, these elements reflect a slice of modern life. I am looking forward to watching the writing career of Will Kostakis! EDIT 8/7/16: Check out his new book ‘The Sidekicks’ here. Purchase ‘The First Third’ here. Book Will Kostakis for school visits through Speakers Ink. Read the first chapter of the book here. Check out his website here.